Thor #251, 1976. 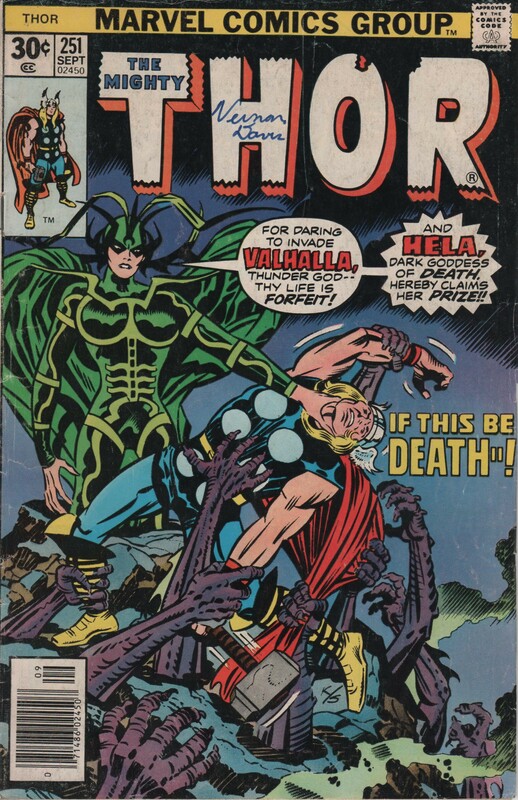 “To Hela and Back” | Magazines and Monsters! OK, first things first. I have no idea who “Norman Davis” is, but he was nice enough to sign the front cover, inside cover, and the first page, in blue marker. Thank you, Norman. Alright, that is a downer, but for fifty cents, I couldn’t pass up this fantastic issue starring the Thunder god, Hela, and others. Story by Len Wein, art by “Big” John Buscema & Tony DeZuniga, and colors by Glynis Wein. Cover by Jack “King” Kirby, Joe Sinnott, and Dan Crespi! Enjoy!